Carl Frampton and Scott Quigg do battle in a world super-bantamweight unification fight in an explosive night of British boxing as the two unbeaten fighters put their records, and their belts, on the line. Who will come out on top in Manchester on Saturday night? Read here our FRAMPTON vs QUIGG betting preview, with free tips, predictions, enhanced odds, free bets and no deposit bonuses on the fight! It's the second night of Premier League of the Newcastle's Metro Radio Arena and Gary Anderson v Michael Van Gerwen is the most anticipated match of the week 2. Don't miss our GARY ANDERSON vs. MICHAEL VAN GERWEN betting preview with free tips, predictions, best odds, streaming links, bookie bonuses and a lot of no deposit free bets! PSG welcome Olympique Lyon to the Parc des Princes for Wednesday's Coupe de France quarter-final match, hoping to keep their domestic treble chances alive. Read below our PSG v LYON betting preview with the best expert tips, predictions, lineups, best odds, bookie promotions and no deposit free bets on the French football! The Carolina Panthers and the Denver Broncos will finally face off for the league’s biggest prize, the Super Bowl 50 at Levi’s Stadium in California. Who will win? The Panthers or the Broncos? Read here our Super Bowl 50 betting preview, with tips, predictions, enhanced odds, free bets and no deposit bonuses on the most anticpated match of the NFL season. The UFC returns from a week off when they hold a Sunday show in Boston and TJ Dillashaw v Dominick Cruz is the marquee fight of the night. Who will win the UFC Bantamweight Championship? Don't miss our DILLASHAW v CRUZ betting preview, with free tips, predictions, enhanced odds, bookie bonuses and no deposit free bets on the fight! David Haye will take on Mark De Mori at London's O2 arena on Saturday January 16.. This article contains our HAYE v DE MORI betting preview, with free tips, predictions, enhanced odds, free bets and no deposit bonuses on the fight! Sunday's PDC World Darts Final will see current champion Gary Anderson and high-flying Adrian Lewis battle for darts' most prestigious title for the second time, with a record first prize of £300,000 on offer. This article contains our ADRIAN LEWIS vs. GARY ANDERSON match preview with betting tips, predictions, highest odds, streaming links, free bets and no deposit bonuses to play on the darts final! Reigning champion Gary Anderson takes on in-form underdog Jelle Klaasen in the second Semi-Final of the PDC World Darts Championship at Ally Pally. Check out here our GARY ANDERSON vs. JELLE KLAASEN betting preview with tips, match predictions, best odds, streaming links, exclusive free bets and a lot of no deposit bonuses! Adrian Lewis and Raymond Van Barneveld, two former World Champions, lock horns in an unmissable semi-final on Saturday night at London's Alexandra Palace. Who will reach the PDC World Darts Championship final? 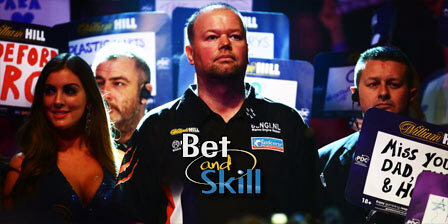 Read here our RAYMOND VAN BARNEVELD vs. ADRIAN LEWIS betting preview with tips, predictions, best odds, streaming links, exclusive free bets and no deposit bonuses to play on the match!